Whether you’re here to visit your favourite winery or wallow in the local lifestyle, you’ll love this town. 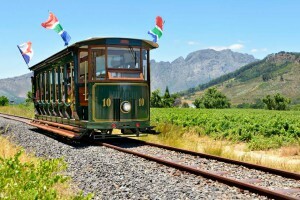 Positioned half way between Stellenbosch and Paarl, Franschhoek has it all: wine, fitness, a handmade goods market, car museum, lots of yummy food, a brewery or two and plenty of fun and adventure to be had in this picturesque valley surrounded by the Drakenstein Mountains. There are places to stay that can fit any budget, from staying with locals via AirBnb to spoiling yourself at one of the luxury hotels. The village is packed with art galleries and fashion boutiques, making it a trending style destination on the outskirts of Cape Town. Zip around town easily on a tuk tuk or land your seat on the Wine Tram and take a tour of the vineyards and tasting rooms without the hassle of driving. For lunch grab a table at the Big Dog café or a picnic at Boschendal and bask in the sun and beauty of the Western Cape. At the end of the day head over to Haute Cabriere for a perfect sunset selfie with the Huguenots Mountains as a photo backdrop. Franschhoek night life is a mix of top restaurants that offer the best food such as Reubens, and down-to-earth pubs that regularly host South African bands playing live music. The high street is the place to show your swag if it’s a pretty little black number and a pair of cute heels you have in mind. 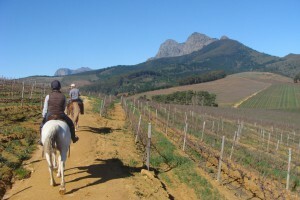 Despite the recent water crisis, Franschhoek definitely peaks in the summer season even though the winter months bring just as much entertainment regardless of the cool weather. Don’t miss the famed Literary Festival and Bastille Festival which celebrates France’s Bastille Day. The town is not just made up of festivals and great places to drink wine but also offers basics such a gym and a number of shops to do groceries and to pick up necessities such as Pick n Pay and Clicks. If you’re planning a wedding, you’ll easily find a beautiful venue for the happy day where friends and family will be surrounded by nature and vineyards. Not only is there a wealth of accommodation to choose from but even the grandest of wedding design can be flawlessly executed with easy access to suppliers of hair, make-up, flowers, wine, photography and catering. There is even a baby sitting service so you can party into the early morning hours. Regardless if it’s a weekend away, time spent with the girls over a glass of champagne or a Friday afternoon escape from the city to enjoy some bread and wine, Franschhoek is a hot travel destination. Here you’ll find the spirit of Paris in the heart of Africa.